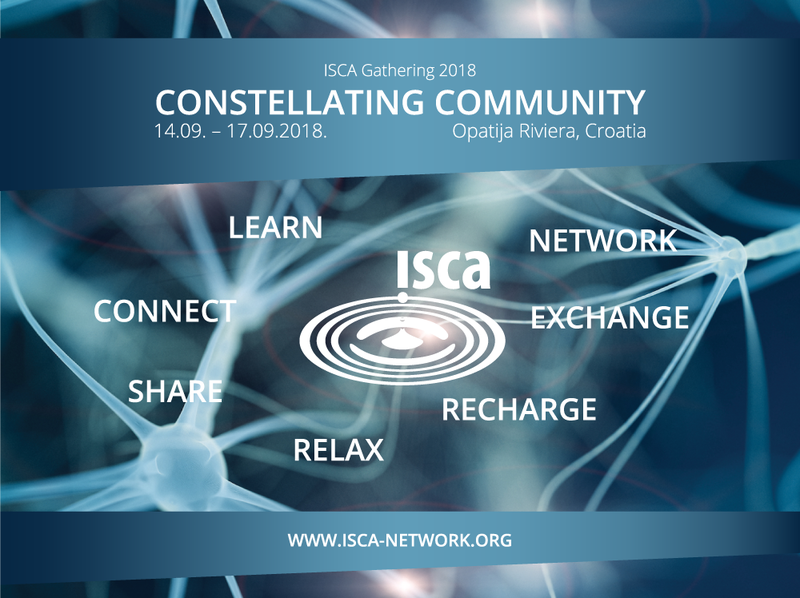 In September 2018 ISCA (International Systemic Constellations Association) is hosting another gathering of constellators, providing the space for sharing, learning and relaxation with colleagues and like minded people. In addition to online contacts, these connections in person provide a valuable opportunity to meet constellators from around the world, to share your experience, present your work and learn about new initiatives, books and training programs. Most of all, it is an opportunity for each of us to find our place in this great world wide network of constellators and our relationship with it. Regardless of the various ways in which we are all connected to Constellation Work, regardless of our constellations learning path and regardless of our belonging to any particular school or association, we all belong to this, constellation field. Following any of the constellations related groups on social media makes one aware of just how much the systemic constellation work has grown. There are many facilitators offering workshops in many corners of the globe, and we can not even begin to guess how many people in the world have benefited from it so far. It is clear that there are many who continue to use this method for their own growth, health and success. Maybe still not as much as the constellators would like it, but it is more widely known of as it is practised on all continents. The variety of forms in which it is practised, types of constellations, settings and fields of applications is staggering, so is the creativity of ways in which constellations are used. The work has come a long way from its beginnings . With close to 40 years since developed by Hellinger in its current form which we know as family or systemic constellations, we have something to reflect and look back on. And the growth is far from over, as the work keeps changing and as many take it in different directions. Despite some confusion which comes as a consequence of this vibrant movement and the different understandings we have about the method, the field of constellations keeps growing and changing, often taking us by surprise. New generations emerge and bring with them the freshness of new ways. There is no single authority which would say which way is better and no single formal body or school or association which can claim “the right way”. Times over, the work itself has proven that no one has a monopoly over it. This is wonderful and will, in my opinion, ensure that it keeps moving and that it stays fresh, not willing to be restrained within any particular structure. By calling this biennial Gathering of constellators “Constellating Community”, ISCA is inviting international constellators to find and explore their relationship to other members of the constellators’ network and to the work itself. “Constellating Community” might be too ambitious a term, more of a wishful future projection than a term which describes a current state of this network. However, there is an invitation to ALL who are in some way connected to the field of constellations to gather for a few days and to share the same space with others, to share their experience and to learn from others, to network, to relax, to have fun, to just connect with others who are equally excited about the work. Some might feel called to offer a presentation or a workshop, and their proposals can be submitted beforehand to the organizers, and then, if there is space left, also at the Gathering itself. So, this is not a training, nor a conference with invited presenters. With the exception of our notable guest speaker Ervin Laszlo, there will be no paid presenters at the Gathering itself, just colleagues sharing among themselves. Facilitators of all levels of experience are welcome. Diversity is encouraged. So are those who are applying the Constellation method creatively in different settings and within different disciplines. Already we have wonderfully diverse contributions with themes of looking at life in the presence of death, nature constellations, a sacred presence through genogram, body symptoms, memories of places, constellations in work with trauma, constellations combined with bioenergetics, constellations related to work setting and branding, experience of a facilitator’s journey and others. During the event, there will be some time devoted to address issues related to the association itself. In addition to assembly, a less formal process will look at some issues relevant to ISCA, and also more generally to constellation associations. Themes like the development of training guidelines, possible accreditation, standards of facilitation and training , “constellation ethics” and other will be explored in the Open Space process. The continuing keeping, management and strategy for ISCA as an international association remains “in flux” and open to what systemically needs to emerge next. The Gathering intends to keep the space open for that. Through the planning and organization of the Gathering, as well as at the event itself, the constellating community is encouraged to reflect on some pertinent questions which seem to continue to exist unanswered in the constellating field, like: What is a constellation? How do we define it? What is Constellation Work – a technique, a method, approach or a new discipline? How do we define the boundaries of the professional field of constellations in relation to other disciplines? How do we develop a constellation community? What are our wishes and hopes for the future of constellations? How do we best meet the emerging future? In preparation for the Gathering, some of these questions were put to the organizers, ISCA Board members, Gathering presenters and some other constellators, in person or via a video link, have been recorded and made available on ISCA web site. So, you can listen to how some constellators think about these matters and check it against your own thoughts. One of the biggest questions which remains unanswered is also how constellations work. Representative perception, a phenomenon on which the whole method rests upon, remains a mystery, or certainly something which can not be explained within a current scientific paradigm our worldview is based on. So, what does that mean for our field, how do we as practitioners deal with that fact and how do we practise it in the mainstream world which tells us that the basic phenomena of our work is not possible to be explained, therefore not really possible to exist? For many years Bert Hellinger and the rest who followed adopted a position “ we do not know how it works, but we know that it works. We can not explain it, and it is not necessary to know how it works for it to be beneficial.” That was a very pragmatic approach which saw the work spread far and wide, and which indeed many benefited from. In the meantime, in the past 30 years or so, a lot has happened in the world in terms of our understanding of the so called “paranormal phenomena” – this “weird” stuff we cannot explain, like channelling the energy of unknown persons, passing of the information through space and time, memories being stored in some field outside of our brain and the like. Much of this “weird stuff” we witness in constellations has found its place in theory and research within different branches of our regular science, like: biology (morphogenetic fields), genetics (inherited experiences of our ancestors) and quantum physics (instant communication between entangled particles across time and space), to name just a few. In addition, some scientists engage in what is usually referred to as “new consciousness theory and research” which explores other phenomena “on the edge”, like: consciousness not disappearing with death, memories not being confined to our brain, channelling the energy of the deceased, telepathy, intuition, healing through information and other. So, something very exciting is happening for the field of constellations. Rather than us attempting to prove the workings and the effects of our approach through classical scientific research and trying to position CW safely within a current scientific paradigm , a new paradigm is emerging – one which can easily accommodate all the phenomena we witness in CW. This new paradigm is about finding the way out of the dualistic dilemma of matter and non-matter and outgrowing our materialistic, mechanistic world view. It is not about the Universe which ticks along due to some mechanistic physical laws, but the Universe which is alive, coherent, holistic, holographic and interactive, in creative relationship and moved by consciousness, imbued and enlivened by the Spirit. It might be that therein lies a true opportunity for CW to step more prominently into the wider world, out of the closet, out of fear of not fitting into the current scientific worldview , and to take a more prominent role in shaping up this new emerging paradigm. Whatever the future holds for our field and for the world, these are the questions that cannot be answered. How does our approach and our world really work? This too will perhaps never be fully explained and known, neither is that necessary. All we can do is ponder these questions and explore the possibilities with open mind, within an open space, in resonance with many other kindred spirits, inspired and in-spirited by the process. We are delighted, honoured and excited that the ISCA Gathering will host one of the leading systemic thinkers in the world as the guest speaker who can really open this space for us; one of the most prominent developers of the new paradigm – Professor Ervin Laszlo. He is President of Club of Budapest, Hungarian philosopher of science, systems and integral theorist, the founder of systems philosophy and the developer of the “Akasha paradigm” – the new conception of cosmos, life and consciousness emerging at the forefront of the contemporary sciences. You can decide for yourself the relevance of his work to CW; you can feel into it. In any case, having such an inspiring speaker will surely leave the Gathering participants enriched. If all this is not enough reason to join us, then we should also mention that the Gathering will take place in Lovran, part of the infamous Opatija Riviera, also referred to as Pearl of Adriatic, right on the coast, at the most beautiful time of the year. So, hope to see many of you there in September.